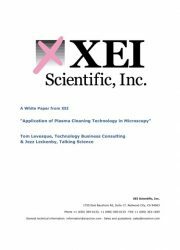 In SEMs, FIBs, and TEMs, contamination is a serious problem for specimen analysis and the production of high-resolution images. Beam-induced carbonaceous material is deposited on the region under study, causing loss of resolution. Hydrocarbon contamination causes the image darkening or “Black Square” in a typical SEM image. 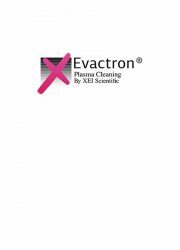 The Evactron De-Contaminator removes hydrocarbon contamination from electron microscopes. A radio frequency (RF) generated plasma is attached to the microscope vacuum chamber. Room air or other oxygen containing gas passes through the plasma, producing oxygen radicals in situ. These radicals clean organic contaminants from the interior of vacuum systems and sample surfaces. The oxygen radicals decompose carbon-containing material into H2O, CO, and CO2, which are evacuated from the system. 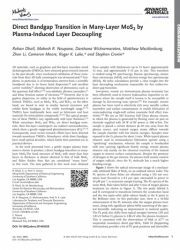 ABSTRACT: The depletions of potassium (K) and sodium (Na) in samples from planetary interiors have long been considered as primary evidence for their volatile behavior during planetary formation processes. Here, we use high-pressure experiments combined with laser ablation analyses to measure the sulfide- silicate and metal-silicate partitioning of K and Na at high pressure (P) – temperature (T) and find that their partitioning into metal strongly increases with temperature. 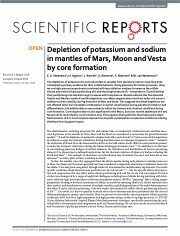 Results indicate that the observed Vestan and Martian mantle K and Na depletions can reflect sequestration into their sulfur-rich cores in addition to their volatility during formation of Mars and Vesta. This suggests that alkali depletions are not affected solely by incomplete condensation or partial volatilization during planetary formation and differentiation, but additionally or even primarily reflect the thermal and chemical conditions during core formation. Core sequestration is also significant for the Moon, but lunar mantle depletions of K and Na cannot be reconciled by core formation only. This supports the hypothesis that measured isotopic fractionations of K in lunar samples represent incomplete condensation or extensive volatile loss during the Moon-forming giant impact. 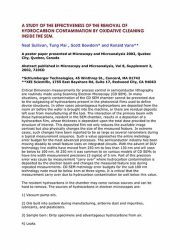 ABSTRACT: Evolution of the UV-induced absorption within the polymer matrix possessing a highly soluble CdS precursor is studied. The initially optically transparent (polymethylmethacrylate based) samples are irradiated by a light-emitting diode operated at 365 nm for different intensities and different temperatures. In situ monitoring of the process is performed at a wavelength of 405 nm where the samples are initially transparent. 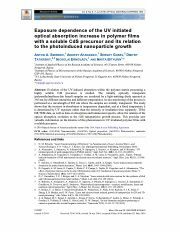 The study shows that the increase in absorbance is temperature dependent, and at a fixed temperature it is determined by UV exposure rather than the intensity or irradiation time separately. TEM, HR TEM data, as well as data on absorption and luminescent spectra, allow the relation of the optical absorption evolution to the CdS nanoparticles growth process. 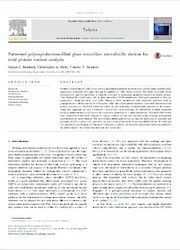 This provides new valuable information on the kinetics of this phenomenon in UV irradiated polymer films with a soluble precursor. 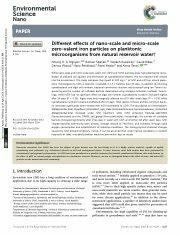 ABSTRACT: While nano-scale and micro-scale zero-valent iron (nZVI and mZVI) particles show high potential for reme- diation of polluted soil aquifers and elimination of cyanobacterial blooms, this has required their release into the environment. This study compares the impact of 100 mg L−1 of nZVI and mZVI on natural plank- tonic microorganisms from a reservoir, incubated in 1.5 L batches over 21 days. In addition to counting cyanobacterial and algal cell numbers, bacterial community structure was assessed using Ion Torrent se- quencing and the number of cultivable bacteria determined using standard cultivation methods. Surpris- ingly, while mZVI had no significant effect on algal cell number, cyanobacteria numbers increased slightly after 14 days (P < 0.05). Algae were only marginally affected by nZVI after seven days (P < 0.05), while cyanobacteria numbers remained unaffected after 21 days. Total species richness and less common bacte- ria increased significantly when treated with mZVI (compared to nZVI). The abundance of Limnohabitans (Betaproteobacteria), Roseiflexus (Chloroflexi), hgcl_clade (Actinobacteria) and Comamonadaceae_unclassified (Betaproteobacteria) increased under nZVI treatment, while mZVI enhanced Opitutae_vadinHA64 (Verrucomicrobia) and the OPB35_soil_group (Verrucomicrobia). Interestingly, the number of cultivable bacteria increased significantly after three days in water with nZVI, and further still after seven days. nZVI shaped bacterial community both directly, through release of FeIJII)/FeIJIII), and indirectly, through rapid oxygen consumption and establishment of reductive conditions. The strong physico-chemical changes caused by nZVI proved temporary; hence, it can be assumed that, under natural conditions in resilient reservoirs or lakes, microbial plankton would recover within days or weeks. 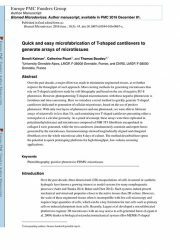 ABSTRACT: Demonstrating the biogenicity of presumptive microfossils in the geological record often requires sup- porting chemical signatures, including isotopic signatures. 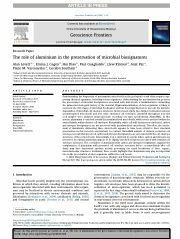 Understanding the mechanisms that promote the preservation of microbial biosignatures associated with microfossils is fundamental to unravelling the palaeomicrobiological history of the material. Organomineralization of microorganisms is likely to represent the first stages of microbial fossilisation and has been hypothesised to prevent the autolytic degradation of microbial cell envelope structures. In the present study, two distinct fossilisation textures (permineralised microfossils and iron oxide encrusted cell envelopes) identified throughout iron-rich rock samples were analysed using nanoscale secondary ion mass spectrometry (NanoSIMS). In this system, aluminium is enriched around the permineralised microfossils, while iron is enriched within the intracellularly, within distinct cell envelopes. Remarkably, while cell wall structures are indicated, carbon and nitrogen biosignatures are not preserved with permineralised microfossils. Therefore, the enrich- ment of aluminium, delineating these microfossils appears to have been critical to their structural preservation in this iron-rich environment. 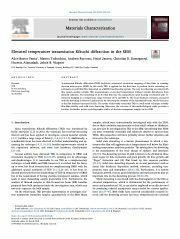 In contrast, NanoSIMS analysis of mineral encrusted cell envelopes reveals that preserved carbon and nitrogen biosignatures are associated with the cell envelope structures of these microfossils. Interestingly, iron is depleted in regions where carbon and nitrogen are preserved. In contrast aluminium appears to be slightly enriched in regions associated with remnant cell envelope structures. The correlation of aluminium with carbon and nitrogen biosignatures suggests the complexation of aluminium with preserved cell envelope structures before or immediately after cell death may have inactivated autolytic activity preventing the rapid breakdown of these organic, macromolecular structures. Combined, these results highlight that aluminium may play an important role in the preservation of microorganisms within the rock record. 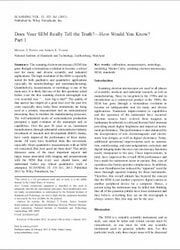 ABSTRACT: Electrochemical CO2 reduction is a critical approach to reducing the globally accelerating CO2 emission and generating value- added products. 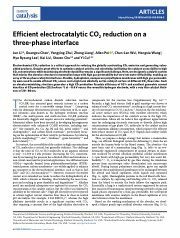 Despite great efforts to optimize catalyst activity and selectivity, facilitating the catalyst accessibility to high CO2 concentrations while maintaining electrode durability remains a significant challenge. Here, we designed a catalytic system that mimics the alveolus structure in mammalian lungs with high gas permeability but very low water diffusibility, enabling an array of three-phase catalytic interfaces. Flexible, hydrophobic, nanoporous polyethylene membranes with high gas permeabil- ity were used to enable efficient CO2 access and a high local alkalinity on the catalyst surface at different CO2 flow rates. Such an alveolus-mimicking structure generates a high CO production Faradaic efficiency of 92% and excellent geometric current densities of CO production (25.5 mA cm−2) at −0.6 V versus the reversible hydrogen electrode, with a very thin catalyst thick- ness of 20−80 nm. 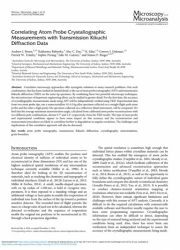 ABSTRACT: Transmission Kikuchi diffraction (TKD) facilitates automated orientation mapping of thin films in scanning electron microscopes (SEM). In this study TKD is applied for the first time to perform in-situ annealing ex- periments on gold thin films deposited on a MEMS-based heating system. 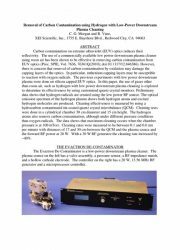 The very local heating associated with this system enables reliable TKD measurements at elevated temperatures without notable disturbance from infrared radiation. The dewetting of an Au thin film into Au nanoparticles upon heating is followed with or- ientation mapping in a temperature range between 20 °C and 900 °C. The local thickness variation associated with the dewetting is observed qualitatively by observing the intensity of the transmitted beam, which decreases as the film thickness increases locally. 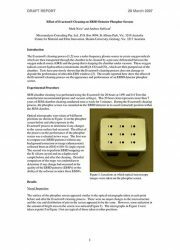 The results of this study reveal that TKD is a well suited technique to study thin-film stability and solid state dewetting. 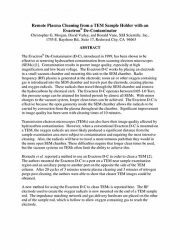 Moreover, the outcome of this methodological study provides a baseline for further in-situ crystallographic studies of electron transparent samples in the SEM. 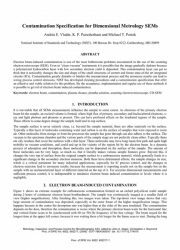 Abstract: This is the fourth part of a series of tutorial papers discussing various causes of measurement uncertainty in scanned particle beam instruments, and some of the solutions researched and developed at NIST and other research institutions. Scanned particle beam instruments, especially the scanning electron microscope (SEM), have gone through tremendous evolution to become indispensable tools for many and diverse scientifc and industrial applications. These improvements have significantly enhanced their performance and made them far easier to operate. But, the ease of operation has also fostered operator complacency. In addition, the user-friendliness has reduced the apparent need for extensive operator training. Unfortunately, this has led to the idea that the SEM is just another expensive “digital camera” or another peripheral device connected to a computer and that all of the problems in obtaining good quality images and data have been solved. Hence, one using these instruments may be lulled into thinking that all of the potential pitfalls have been fully eliminated and believing that, everything one sees on the micrograph is always correct. But, as described in this and the earlier papers, this may not be the case. Care must always be taken when reliable quantitative data are being sought. The first paper in this series discussed some of the issues related to signal generation in the SEM, including instrument calibration, electron beam-sample interactions and the need for physics-based modeling to understand the actual image formation mechanisms to properly interpret SEM images. The second paper has discussed another major issue confronting the microscopist: specimen contamination and methods to eliminate it. The third paper discussed mechanical vibration and stage drift and some useful solutions to mitigate the problems caused by them, and here, in this the fourth contribution, the issues related to specimen “charging” and its mitigation are discussed relative to dimensional metrology. Summary: The scanning electron microscope (SEM) has gone through a tremendous evolution to become indispensable for many and diverse scientific and industrial applications. The improvements have signifi- cantly enriched and augmented the overall SEM performance and have made the instrument far easier to operate. But, the ease of operation also might lead, through operator complacency, to poor results. In addition, the user friendliness has seemingly reduced the need for thorough operator training for using these complex instruments. One might then conclude that the SEM is just a very expensive digital camera or another peripheral device for a computer. Hence, a person using the instrument may be lulled into thinking that all of the potential pitfalls have been eliminated and they believe everything they see on the micrograph is always correct. But, this may not be the case. 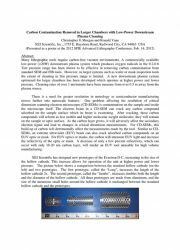 An earlier paper (Part 1), discussed some of the potential issues related to signal generation in the SEM, instrument calibration, electron beam interactions and the need for physics-based modeling to understand the actual image formation mechanisms. All these were summed together in a discussion of how these issues effect measurements made with the instrument. 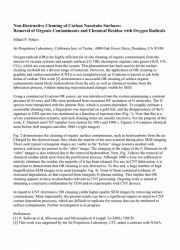 This second paper discusses another major issue confronting the microscopist: electron-beam-induced specimen contamination. 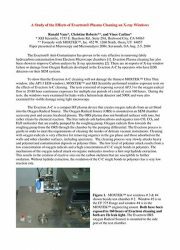 Over the years, NIST has done a great deal of research into the issue of sample contamination and its removal and elimination and some of this work is reviewed and discussed here. 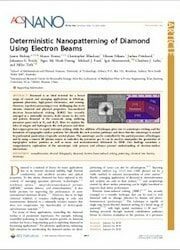 ABSTRACT: Diamond is an ideal material for a broad range of current and emerging applications in tribology, quantum photonics, high-power electronics, and sensing. However, top-down processing is very challenging due to its extreme chemical and physical properties. Gas-mediated electron beam-induced etching (EBIE) has recently emerged as a minimally invasive, facile means to dry etch and pattern diamond at the nanoscale using oxidizing precursor gases such as O2 and H2O. Here we explain the roles of oxygen and hydrogen in the etch process and show that oxygen gives rise to rapid, isotropic etching, while the addition of hydrogen gives rise to anisotropic etching and the formation of topographic surface patterns. We identify the etch reaction pathways and show that the anisotropy is caused by preferential passivation of specific crystal planes. The anisotropy can be controlled by the partial pressure of hydrogen and by using a remote RF plasma source to radicalize the precursor gas. It can be used to manipulate the geometries of topographic surface patterns as well as nano- and microstructures fabricated by EBIE. Our findings constitute a comprehensive explanation of the anisotropic etch process and advance present understanding of electron-surface interactions. 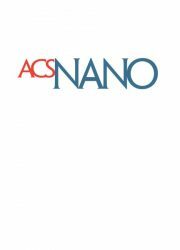 ABSTRACT: Membrane based microfluidic devices have gained much popularity in recent years, as they make possible rapid, inexpensive analytical techniques that can be applied to a wide variety of areas. The ability to modify device hydrophilicity and hydrophobicity is critically important in fabricating membrane based microfluidic devices. Polar hydrophilic membranes, such as glass microfiber (GMF) membranes, hold great potential as they are inexpensive, chemically inert, and stable. Filling of these membranes with non-polar polymers such as polycaprolactone (PCL) converts the hydrophilic GMF into a hydrophobic medium. Controlled alteration of the surface chemistry of PCL/GMF substrates allows for the fabrication of microfluidic patterns on the surface. Using this approach, we have developed a simple and rapid technique for fabrication of highly adaptable complex multidimensional (2D and 3D) microfluidic pathways on a single membrane. PCL-filled GMF media were masked and selectively exposed to oxygen radicals so that the exposed surface became permanently superhydrophilic in its behavior. The desired microfluidic pattern was cut into the mask prior to assembly and exposure, and the mask was removed after exposure to reveal the ready-to-use microfluidic device. 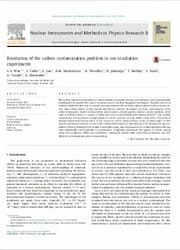 To verify and demonstrate the performance of this novel fabrication method, a colorimetric total protein assay was applied to the determination of protein concentrations in real samples. 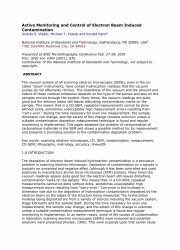 ABSTRACT: The widely experienced problem of carbon uptake in samples during ion irradiation was systematically investigated to identify the source of carbon and to develop mitigation techniques. Possible sources of carbon included carbon ions or neutrals incorporated into the ion beam, hydrocarbons in the vacuum sys- tem, and carbon species on the sample and fixture surfaces. 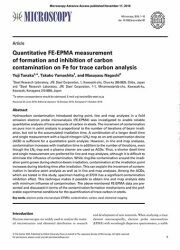 Secondary ion mass spectrometry, atom probe tomography, elastic backscattering spectrometry, and principally, nuclear reaction analysis, were used to profile carbon in a variety of substrates prior to and following irradiation with Fe2+ ions at high temperature. Ion irradiation of high purity Si and Ni, and also of alloy 800H coated with a thin film of alumina eliminated the ion beam as the source of carbon. Hydrocarbons in the vacuum and/or on the sample and fixtures was the source of the carbon that became incorporated into the samples during irra- diation. 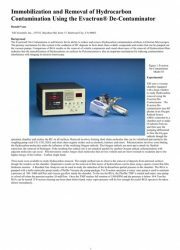 Plasma cleaning of the sample and sample stage, and incorporation of a liquid nitrogen cold trap both individually and especially in combination, completely eliminated the uptake of carbon during heavy ion irradiation. While less convenient, coating the sample with a thin film of alumina was also effective in eliminating carbon incorporation. 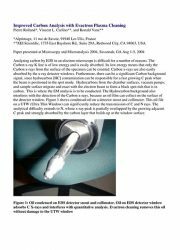 ABSTRACT: Hydrocarbon contamination introduced during point, line and map analyses in a field emission electron probe microanalysis (FE-EPMA) was investigated to enable reliable quantitative analysis of trace amounts of carbon in steels. The increment of contamination on pure iron in point analysis is proportional to the number of iterations of beam irradi- ation, but not to the accumulated irradiation time. 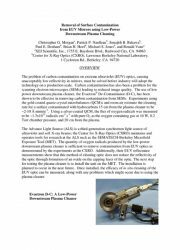 ABSTRACT: We report Raman and photoluminescence spectra of mono- and few-layer WSe2 and MoSe2 taken before and after exposure to a remote oxygen plasma. For bilayer and trilayer WSe2, we observe an increase in the photoluminescence intensity and a blue shift of the photoluminescence peak positions after oxygen plasma treatment. 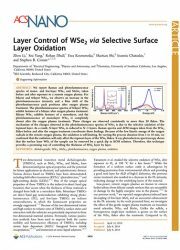 The photoluminescence spectra of trilayer WSe2 exhibit features of a bilayer after oxygen plasma treatment. 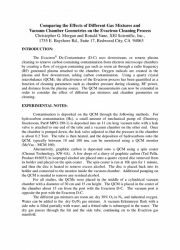 ABSTRACT: We report circularly polarized photoluminescence spectra taken from few layer MoS2 after treatment with a remotely generated oxygen plasma. Here, the oxygen plasma decouples the individual layers in MoS2 by perturbing the weak interlayer van der Waals forces without damaging the lattice structure. 2D materials, such as graphene and few-layer transition metal dichalcogenides (TMDCs), have attracted great research interest in the past decade, since mechanical exfoliation of these materials from their 3D bulk counterparts was demonstrated. 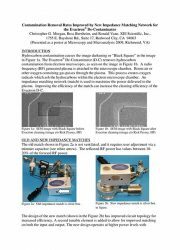 Presentation at SPIE Microlilthography Conference Feb 27-28, 2001; Proc SPIE, Vol. 4344(2001): 835. 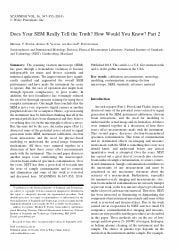 A complete paper with CD SEM data. The problem of carbon contamination on extreme ultraviolet (EUV) optics, causing unacceptably low reflectivity in mirrors, must be solved before industry will adopt the technology on a production scale. 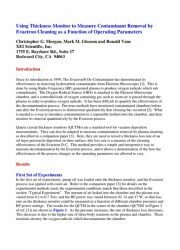 The quantity of oxygen radicals produced by the low-power downstream plasma cleaner is sufficient to remove contamination from EUV optics as demonstrated by the experiments. Additionally, EUV reflectance measurements show that this method of cleaning optics does not reduce the reflectivity of the optic through formation of an oxide on the capping layer of the optic. A new method for using the Evactron D-C to clean TEMs is reported. The RF electrode used to create the oxygen radicals is now mounted on the end of a TEM sample rod. The impedance matching network and gas delivery hardware are placed on the other end of the sample rod, which is hollow to allow oxygen containing gas to reach the electrode. 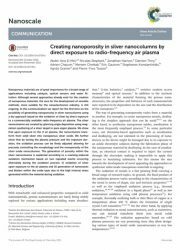 A very positive effect of Evactron downstream plasma cleaning in the prevention of hydrocarbon buildup in nanomanipulator probe tips is reported in this poster. 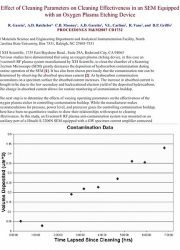 A complete paper showing that long term cleaning of ultra thin windows (UTW) does not cause window failure. 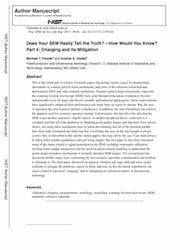 A complete paper on EDS analysis of carbon. 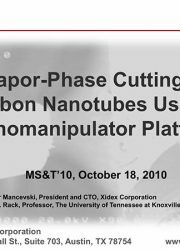 Xidex has developed the NanoBot® nanomanipulator, which can be used as a vapor-phase cutting system to etch carbon nanotubes. 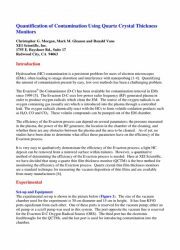 They report (see slide 19) that plasma cleaning using the Evactron De-Contaminator inside the SEM chamber can reduce competitive carbon deposition and enhance etching. Comparison of Residual Gas Analysis results on the removal of volatile components and visual observance of the removal of Hydrocarbon films indicates that the immobilization of Hydrocarbons on surfaces by polymerization using the Evactron De-Contaminator is also an important mechanism for reducing contamination interference with imaging in electron microscopy. Quartz crystal microbalances (QCMs) are a standard tool for vacuum deposition measurements. They can also be adapted to measure contamination removal by plasma cleaning. Here, they are used to record a thickness loss rate of an oil layer previously deposited on their surface; this loss rate is a measure of the cleaning effectiveness of the Evactron Decontaminator. 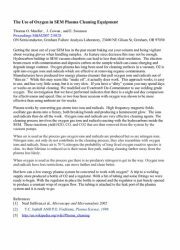 View first PDF document here. 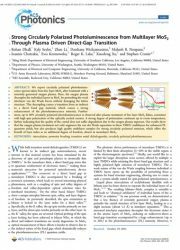 Paper presented at SPIE Advanced Lithography Conference Feb. 14, 2012, San Jose CA. Many lithographic tools require carbon-free vacuum environments. A commercially available low-power (<20W) downstream plasma system which produces oxygen radicals in the 0.2-0.6 Torr pressure range has been shown to be effective in removing carbon contamination from standard SEM and FIB tools. However, in larger systems such as wafer or mask inspection tools the extent of cleaning in this pressure range is limited. A new downstream plasma system optimized for larger chambers has been developed which operates at higher power and lower pressure. Cleaning rates of over 1 nm/minute have been measure from over 0.5 m away from the plasma source. Still have questions that we did not answer above? Contact XEI Scientific, Inc. with any further inquiries. We will be glad to help you.